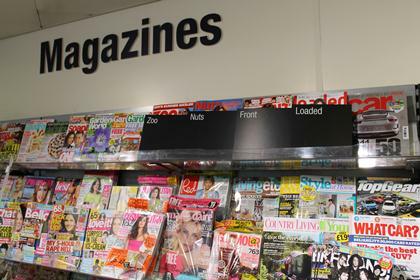 Publishers have hit back at the Co-operative Group after it issued an ultimatum insisting that all lads' mags had to be covered up by September 9. The Manchester-based retailer has said it is responding to concerns of customers and members over the front-cover images of scantily clad women. Titles such as Front, Loaded, Nuts and Zoo were told to introduce opaque covers by September's deadline or face being withdrawn from the shelves. The publisher of The Sport newspapers has already agreed with the demand, but others have made their opposition clear. A spokesperson for Nuts publisher IPC Media said: "The content and covers of Nuts are perfectly legal and the magazine is enjoyed by over half a million UK consumers – both men and women – every week. “IPC Media supports the responsible display of all men’s magazines and guidelines created by the industry through the Professional Publishers Association (PPA), and endorsed by the Home Office and recommended by the Bailey Review. Bauer Media, which publishes Zoo, said it had already begun to change the title’s cover imagery but did not say whether it would agree to the Co-op's latest demand. Loaded editor James Wallis went so far as to label the retailer's move as “a very real threat to the free press and freedom of speech in the UK”. Cathryn Higgs, a policy manager at the Co-op, said that the group was currently "in dialogue" with magazine publishers. She said: "I've got every hope they will take what we believe is the responsible approach and put them in a bag."